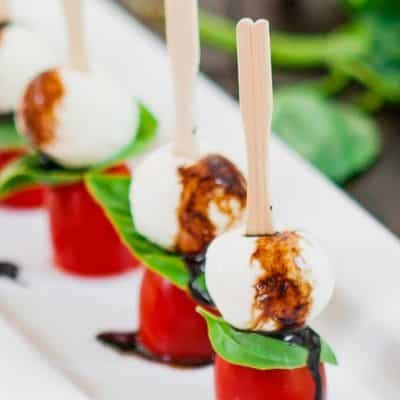 Mini Caprese Salad Bites – a most delicious salad served in a most elegant way. The perfect appetizer for a party, or just simply because! Caprese Salad or Insalata Caprese is a very simple salad from Italy consisting of fresh mozzarella cheese, tomatoes, basil and olive oil and seasoned with salt and pepper. I think the beauty of this salad is its simplicity and the fact that it consists of the Italian flag colors. Different versions of it include using balsamic vinegar and that’s what I chose to do with mine today. I love this salad, and we make it almost every night of the week because of how simple it is. We use fresh bocconcini for it and if you’ve never had bocconcini, all it is is small pieces of fresh mozzarella cheese. We also tried something different this time, I say we because it was my husband’s idea to do this and he’s the salad king at our house. We tried a balsamic reduction instead of just plain old balsamic vinegar. I think it was a great idea, mostly because it looks better and if you’re making this for a party I strongly recommend using a balsamic reduction instead. A balsamic reduction all it is is just cooking the balsamic vinegar for a while and it will reduce to less than half and thicken in the process, so the flavor is more concentrated. One more thing I want to say about this caprese salad, isn’t this the cutest presentation you’ve ever seen? I mean how adorable and perfect is this for an appetizer at a party? It’s brilliant! I know, you’ll impress everyone! 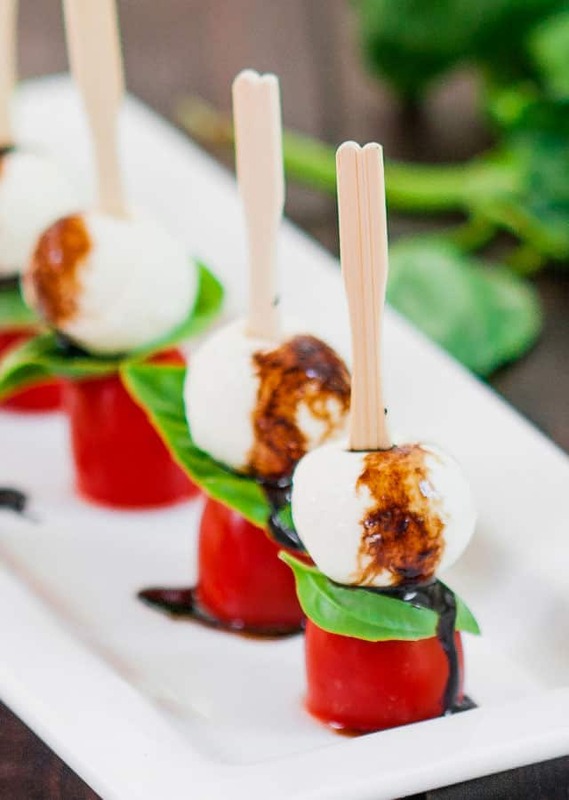 Mini Caprese Salad Bites - a most delicious salad served in a most elegant way. The perfect appetizer for a party, or just simply because! In a small skillet add the balsamic vinegar and cook over medium heat until it reduced to less than half and thickened. Make sure you stir occasionally. It should only take about 5 to 10 minutes, depending on the amount you're reducing. 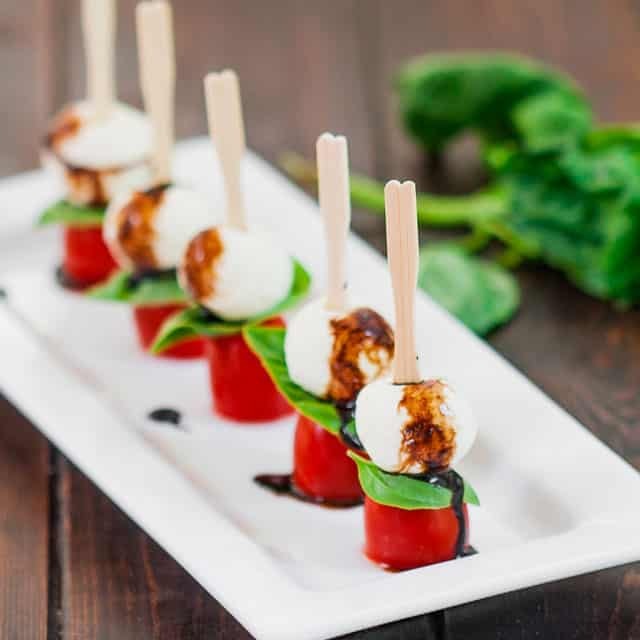 Take a toothpick and on it stick a bocconcini, a basil leaf and a cherry tomato. Repeat with remaining ingredients. Using a teaspoon drizzle some of the balsamic reduction onto each appetizer. Why do you reduce the balsamic vinegar ??? Reducing the balsamic vinegar gives it a thicker more glaze like consistency. I make these all the time. I use a strawberry balsamic reduction. Goes so well when having company. It’s quick, easy and fresh. I even make them for my lunch as a healthy lunch. I am trying to figure out how many this recipe makes? I am planning a party of appetizers. I appreciate your response. Well it depends on the size of your tomatoes and bocconcini, but you should get about 15 to 20. HI Jo, I am making these for a potluck. Would the balsamic reduction still be good the next day? Would I need to put it in the fridge until I use it? Sure you can make the reduction ahead and I would keep it in the fridge . These little bites are always a hit and taste so fresh..
Definitely put balsamic vinegar in fridge if using the next day. Do not put it on caprese salad bites until just before serving. I just made 10 just to get the visual for my dinner party tomorrow. I will make the rest tomorrow because they are very easy to assemble. They look adorable, I wish I could enclose the photo I just took. I cut a little of the bottom of the tomatoes, and they are standing up like proud little soldiers! Thank you for sharing this yummy idea for an appetizer ! You probably could on facebook if you follow me. So glad you liked them. They are totally adorable! I’ve been making these for years, only I call it “salad on a stick”. You can change out the mozzarella for a feta cube, add a small dice of cucumber, and a piece of kalamata olive. Use a Greek-style dressing and call it “Greek salad on a stick”. Could these been made the night before and refrigerated? I’m unsure of how well this would keep. I think they’d be ok, though I wouldn’t drizzle the balsamic on them until served. I’m always looking for a dish for parties that makes a nice presentation, and this one is perfect! I’m in love with the simple combination of mozzarella and tomato, and I love the way you presented it. This would be the perfect appetizer for a get-together!